Burgess sells them very inexpensively but they call them Western Sand Cherries. Other catalogs call them different things. But look for Prunus besseyi, the scientific name, if unsure. Our grapes really took off this summer. We have ten different varieties and some are bearing this year. 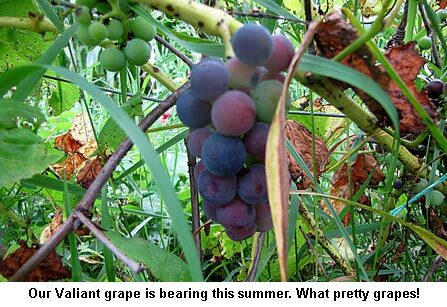 Our Valiant is leading the pack with ripe, tasty bunches of beautiful grapes. I wanted to make a grape arbor for them out of stock panels this spring but that never got done. Oh well, maybe next spring? Will do. But our grapes are just out in the open and sure aren’t babied. I don’t even mulch them. BUT they are all very hardy varieties. I’d die for a sweet seedless grape! Ours are great for juice and jelly but eating….not so hot as they are pretty tart. But around here, LIVING is a good thing! So are we!!! And we are SO greatful to be able to do it. We eat like kings! No, we don’t do anything special. If anything, they are kind of neglected. The cherries are sweet when very ripe but when not quite ripe they are astringent like chokecherries. But they sure make great jelly and jam!!! We’ve got Nankings too, and have never gotten a single cherry. They flower very early and we usually get those nasty spring frosts!! We’re still waiting. I’m in awe at the amount of food you grow. 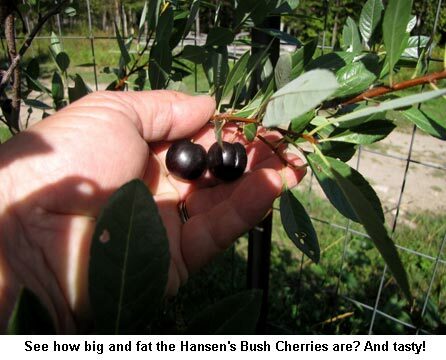 Do you do anything special to the Hansen’s cherry? I have 2 bushes & rarely see more than a dozen small, very sour berries. It also seems to flower later than the Nanking. I managed to “rehome” quite of few of my Nanking babies.